One of the perks of my writing on Christianity, politics and society is that each year I am invited to the Archbishop of Canterbury’s annual reception at Lambeth Palace for those involved in the media. It’s a chance to do a bit of networking and meet some new faces, but also to hear Justin Welby give a short speech that usually offers a small insight into his job. At his latest gathering last Wednesday he gave a reminder that when the press is always keen to find a story involving you, sometimes what you say isn’t reported exactly as you meant it and occasionally you don’t help yourself by not fully considering how your words and actions will be interpreted once they start being scrutinised in the public arena. To illustrate this point, Archbishop Justin gave the example of the new book On Rock or Sand? edited by the Archbishop of York, John Sentamu. It brings together a collection of essays by experts from various fields on the moral state of the nation. It has widely been reported that the book has been used as a pre-election attack on the Coalition Government and its policies – and for good reason. Quoting Karl Marx and describing your opinions as ‘left wing’, as Dr Sentamu did in his interview with John Bingham for the Telegraph, did neither himself nor his book any favours, as His Grace quite rightly responded. This is always the difficulty when the Church makes political interventions. When it comes to morality, poverty has rightly been a major concern for churches and Christian organisations over the last few years. The opinions of bishops and leaders carry weight because Christians up and down the country are taking practical action to support those in need. This is as it should be: Christianity divorced from compassion is an empty shell of ritual, but helping others without considering the reason they need that support in the first place will only lead to exhaustion and frustration. It is impossible to carry out widespread action to relieve poverty without there being a political dimension. However, when the discussion turns to government cuts, the evils of income inequality and families not being able to get by, the danger is that we slip into a simplistic way of speaking that either directly or indirectly blames the government for all of our social ills. It’s easy to say that the rich should be taxed more or that welfare for the poor should be increased. These might be partial solutions, but there’s a limit to how much they could fix. There is much more to poverty than just a lack of money. Take poverty of aspiration, lack of education or family breakdown for example. Then we have matters at a wider level of economics, growth and austerity. A genuine improvement in our response to poverty will only come when people are not only valued and respected whatever their situation, but also when we understand the bigger picture and consider it from all angles. I recently spoke to a Christian journalist who was bemoaning the fact that they always struggled to find Christians willing to give comment on economic policy. Finding someone to talk about food poverty is much more straightforward. It’s partly because being short of cash to buy a meal is a lot easier to understand than government finances, but if the Church is serious about the politics of serving the poor then neither of these can be ignored because they are intrinsically linked. I find it deeply concerning that, as a nation, we are so indebted that we’re paying £1 billion in interest every week. Based on current projections, these payments will reach £70 billion annually in the next three years, which is more than Britain spends on defence, schools and housing. If this is the sort of thing that Christians should care about – and I believe it is – then we need to be willing to widen the conversation and openly deal with the inevitable disagreements that will go with it. There is no single right Christian answer for many of these issues, which is why different Christians find themselves supporting a range of political parties. Perhaps On Rock or Sand? would have been perceived as less party political, as Archbishop Justin had hoped, if it had done just that. 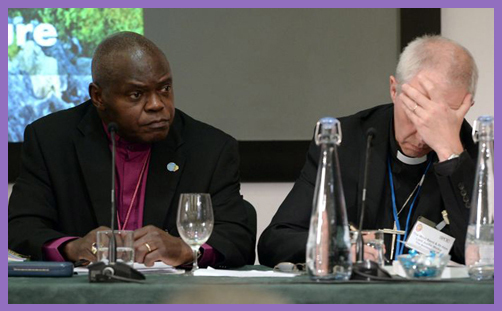 What we mustn’t lose sight of amongst any criticism is the need for the Church to continue doing what Dr Sentamu’s book is trying to achieve, and that is to move the political conversation forward and develop a vision for where we want to be as a society. Inevitably the Church will make mistakes and get things wrong, but the worst it can do is say nothing. In an age when disillusionment in party politics is running so high, we need the Church to be making a valuable contribution to restore hope – even if by doing so it sometimes ends up being accused of political bias along the way. An edited version of this article first appeared at Christian Today on the 2nd of February.